Alberto Giacometti, the famous Swiss sculptor, is extremely well known in the art world for his eerie, slender, bronze figures, which are immediately recognizable. Giacometti was a strange, dark character to be sure, but he led a life full of tender and surprising anecdotes that will interest any of this genius’ admirers. Giovanni Giacometti, Alberto’s father, was a well-regarded Swiss impressionist painter, and his godfather was none other that Cuno Amiet, the symbolist painter. Thanks to these enriching, immersive influences, his passion for sculpture brought him to Paris at the age of 21 to study at the Académie de la Grande Chaumière, which was run by the famous sculptor Antoine Bourdelle, a former student of Rodin. Although he was quickly disappointed by the master’s teachings and did not visit the academy very regularly, this period of apprenticeship introduced him to non-Western forms of representations and allowed him to learn all about monumentality and base, something that would become essential in the creation of his slender figures. The first sculpture Alberto ever created was in his father’s studio when he was only 14 — he sculpted the bust of his brother Diego, who was a year younger than him. The two brothers would remain inseparable for the rest of their lives, and more than any woman or friend, it was Diego who would become Alberto’s life-long partner. Diego moved to Paris in 1925 to help Alberto out and was his model for more than 50 years. In the 1930s, Diego collaborated with others to make furniture and other decorative arts, but was always truly with his brother. Diego was so close and loyal to his brother that though Alberto spent the war years in Switzerland, Diego remained in Paris until his return in 1945, as a custodian and keeper of their studio/apartment. Giacometti was a very peculiar character, and in the same way that he stuck to his favorite model till the end of his days, he also stayed in the same tiny, dark and uncomfortable studio at 46 rue Hippolyte-Maindron for his entire life. The brothers moved to a 4.75 x 4.90 m studio in 1926 and never left it. Diego always slept there, and if Alberto was not there too, he was in a nearby hotel. Even his wife Anette, whom he married decades later, had to make this claustrophobic space a home. In 1957, the poet Jean Genet, fascinated by the artist’s eccentric austerity and disregard for comfort, wrote The Studio of Alberto Giacometti. 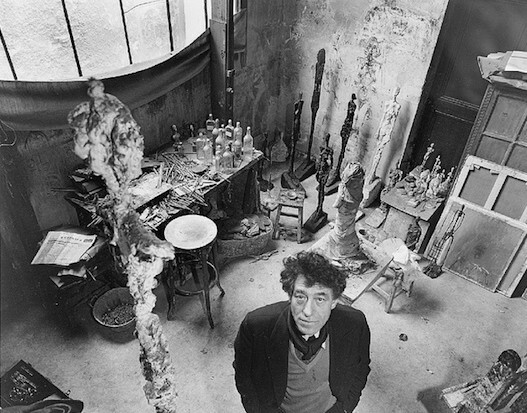 Alberto Giacometti’s life-long obsession was the heads of the people around him and the faces of those closest to him, like Diego, his wife Annette, or his lovers and friends. He said of Diego: ‘When he poses for me I don’t recognize him’ — and this was the frustrating realization that drove him to try and express his true visions over and over again. At 25, he gave up the attempt, thinking that he would never be able to represent these features as he ‘really’ saw them, but these faces kept haunting him, and ten years later, in spite of himself, he returned to human anatomy. He claimed to never think of the interior or psychology of the people he loved when he portrayed them, and yet he restlessly tried to realize his vision of their faces and silhouettes in sculpture, without, according to him, ever succeeding. During a break in which he seemingly had given up on representational sculpture, Giacometti began to study the latest developments in abstract art and Cubism in Europe, as well as the art of Oceania and primitive influence. The surrealists reacted with excitement to Giacometti’s productions at the time — especially ‘Gazing Head’ in 1929 — and they wrote texts on his pieces, defining them as ‘true fetishes’ and accepting him into the movement. In the early years of the 1930s, Giacometti willingly associated himself with the group led by André Breton, participated in collective exhibitions, and wrote in their journals. But this association didn’t last long, and around 1935, Giacometti begun flirting with figuration once again and had models sit for him. The surrealists felt betrayed by him and set up a meeting which turned out to be more of an interrogation. It was then that Giacometti was expelled from the group and had to break ties with many of his surrealist friends, with the exception of Aragon and Ernst. It didn’t take Alberto long to attract the attention of people like Masson, Arp, Miró, Calder or even Picasso. Less than five years in Paris were enough for the young Swiss artist’s exhibitions to be covered by poets and writers like Bataille or Aragon. After falling out with the Surrealists, figurative painters like Balthus or Derain also reached out to him. He was approached by many admirers in Saint-Germain, where he frequented cafés, and soon, the likes of Samuel Beckett and Sartre and Simone de Beauvoir did the same. Beckett was his companion in his nightly adventures through the Parisian brothels and bars, and in the daytime, Alberto often visited Picasso in his studio. Alberto was known to have a great sense of humor; he was successful throughout his lifetime; he was loved by artists and women alike; yet, when you look at pictures of him, you’ll notice that the man rarely smiled. The truth is that Alberto’s teeth were a mess. He was a chain smoker and coffee made up most of the meals he consumed in his teeny Montparnasse studio. These bad habits ultimately led him to suffer from stomach problems and later, cancer. Although he battled it and won at first, his exhausting routines and stubborn bad habits led him to succumb in the end. In interviews or photos, a quick, shy grin is all you would see from him.